in association with the SSK, Inc.
3rd Latin Madness Show a go! The first Off-Broadway Mambo Musical Latin Madness proved to be a huge success this past weekend (April 27th, 28th & 29th). Cast members performed to a sold out theater on Friday and Saturday. Even the last minute additional Sunday show filled to an almost sold out capacity. The audience seemed extremely pleased with this first-of-a-kind mambo production mixing mambo dancing and comedy. Latin Madness Promoters & NY Mambo Instructors Nelson Flores and Carlos Mendoza are to be commended for pulling off what no one else has been able to do before, while simultaneously proving to skeptics that the NY Mambo Dance Community is very capable of working together. The Audience was treated to the top-notch performances of the Descarga Latina Dance Comany, Santo Rico Dance Company, The Addie-tude Dance Company, The Abakua Dancers, Jai & Candy and The Mambo Mamas and The Papa. Latin Madness featured the dance choreography of Addie Diaz, Thomas Guerrero, Abby Plotkin, Frankie Martinez, Jai Catalano/Candy Mena & Nelson Flores. Special credit should be given to Mr. Herb Quinones who was the MC/Comedian of the show and successfully held together the play by keeping the flow between performances going. People from London, Japan, Canada as well as Connecticut and Washington DC came in to witness the event. The interest in the show has been so great that on the following Monday after the show (May 1st), an additional 47 individuals had contacted the promoters to place themselves on a waiting list for a fourth possible show. 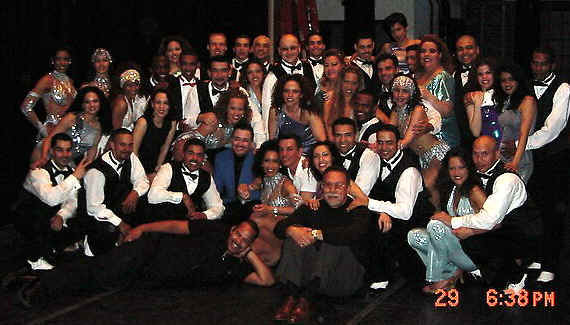 SalsaNewYork has been informed that SundayÂ’s show was not the last performance of Latin Madness, only the beginning. Stay tuned for the May 2001 Issue of SalsaNewYork Magazine to see a behind the scene Latin Madness Photo Essay (only available on SalsaNewYork.com). Latin Madness made the written Press this week when the Wednesday May 2, 2001 issue of the New York Spanish Newspaper "El Dario La Prensa" published several photos of the cast members at the "Latin Madness After Party" at the China Club. The photo spread included one picture of the entire cast taken right after its final number this past Sunday, the 29th of April. It was the first official mention and appearance of the show on printed media. Those who have been following the development of the Latin Madness story know that this Off-Broadway Mambo Musical was able to sell out its first two shows at the Heckscher Theater and needed to add a third show all through word of mouth and internet publicity. The buzz on the show had been so good that 47 different individuals had contacted the promoters in hope of gaining tickets for a 4th possible show. Is this the end of "Latin Madness".... We think NOT!!! Stay tune for SalsaNewYork for Behind the scene photos of the cast during rehearsals and during the actual performance of the play. Well It finally happen! As of Thursday April 12th, Tickets for the Off-Broadway Musical "Latin Madness" have finally SOLD OUT!!!. The producers of this first time mambo showcase have informed SalsaNewYork that they sold their last available ticket. This ticket buying frenzy started roughly a month ago when the show first opened with 1200 empty seats (600 for each night). People had been scrambling to buy tickets from the very beginning as cast members went into rehearsals. What's been so incredible about this financial feat is that its all been done via word of mouth and through the internet. So much interest has been shown both in and out of NY that a Toronto website (tosalsa.com) has organized a CONTEST where people can earn a chance to win two front row tickets to the Saturday "Latin Madness" show. This is an absolute "1st" in NY mambo & theatrical history. It is not a simple dance performance, but a never seen before theatrical-dramatic-musical about the NY world of mambo. Latin Madness is the play that will pave the way for salsa and its dancers to one day grace the stages of Broadway. The Buzz both on and off the internet is great. Many people are both excited to witness a first in Salsa/Mambo history as well as seeing several of the never-seen-before dance routines debuting in the show. The promoters and dancers have already met, rehearsals are already in progress with more rehearsal dates being confirmed as we speak. Scroll down for a description of the show and info on how to purchase tickets. "Latin Madness" is the dynamic New mambo musical (produced by Nelson Flores & Carlos Mendoza) that guides audiences through the last 25 years of the ever-changing NY Latin dance scene. It's a journey that begins with the gyrating rhythms of disco in the '70's. It takes you to the '80's where mambo was reborn, and the pulsating beat of break-dancing filled the streets, and even visits Side Street, the Bronx dancers' haven where Latin Dancers competed for bragging rights. This is not simply a dance performance. It is a big musical-dramatic-comedy Off-Broadway production with great music and dance, fun and laughter, showcasing some of New York's finest mambo dancers. It is of interest not only to dancers, but also to theater, music and dance lovers, so please invite your non-dancer friends and families. Ticket purchase Now available On-line!!! Due to the huge demand, Latin Madness tickets can be purchased on-line. Click here to buy tickets directly on-line. The Show currently boasts the performances of 38 dancers from Descarga Latina, Abakua, Mambo Mamas, Santo Rico, Addie-tude & Jai & Candy. These are performances and choreography by some of NY/NJ's favorite mambo instructors/choreographers/directors such as Nelson Flores, Addie Diaz, Thomas Guerrero, Jai Catalano, Candy Mena, Frankie Martinez, Steve Seda, Jesus Nieves. And also there will be a performance by special guest Ray Sepulveda. Stay tuned for further updates about this event from SalsaNewYork.com, on this page: the NY News section. Female dancers from Nelson Flores' Descarga Latina Dance Co., Addie Diaz's Addie-tude Dance Co. and Frankie Martinez's Abakua Dance Co. rehearse the finishing number together. The cast of the sold-out Off-Broadway Mambo Dancing show "Latin Madness" continue to rehearse this past weekend over the Side Street Kids Academy. Cast members of Nelson Flores's Descarga Latina, Addie Diaz's Addie-Tude and Frankie Martinez's Abukua have been busy these past few weeks and were finally joined by members of Thomas Guerrero's Santo Rico, Abby Potkin's Mambo Mamas and Jai and Candy. The focus of attention this week continues to be the finishing number, as well as the opening number which will involves members of the various groups performing in the show. The rest of the time was spent reviewing what was covered during the previous weeks of rehearsal as well as helping newcomers catch up with the material that they are expected to know for the show. Cooperation is top priority for this NY Mambo first event. LATIN MADNESS is proving to be a first for the NY/NJ mambo dance community as members from these different teams learn to work together and blend their distinct styles of dancing into one show. Individual team pride has been put to one side for the greater good of the show. The general consensus is that once through the door there is only one dance company.....The "Latin Madness" cast dancers. The show is benefiting from the work of various choreographers and the enthusiasm is high amongst cast members who have been waiting for such an opportunity to take the art of mambo dancing to a new performance level. Various new numbers from Descarga Latina, Addie-tude and Abakua (many of them never seen before), will be debuted at the show. To roughly para-phrase Co-promoter of the event Carlos Mendoza, "the purpose of the show is to educate people on the art and beauty of this dance form that we call mambo". Latin Madness Male cast members from Nelson Flores' Descarga Latina Dance Co., Addie Diaz's Addie-tude Dance Co. and Frankie Martinez's Abakua Dance Co. rehearse their entrances and exits for the final number. Rose Lau has informed SalsaNewYork that Tosalsa.com (a Toronto Salsa Website) and Body Chemistry are giving away TWO FRONT ROW tickets to the Saturday, April 28th SOLD OUT SHOW, "Latin Madness" the first off-broadway Mambo Musical produced by Nelson Flores and Carlos Mendoza at the Heckscher Theater in New York City. New Yorkers are also invited to participate in this event. Contest closes on Saturday, April 21st! So if you thought you missed out on getting tickets for LATIN MADNESS, this may be your last chance (and front row seats too!). For more information on the contest and how to win surf on over www.tosalsa.com for details. The Producers of the SOLD OUT Off-Broadway Musical "Latin Madness" have informed SalsaNewYork that they have confirmed enough seats (minimum was 300) to open the 3rd show. Since the original Saturday and Sunday presentations had sold out, the producers were faced with the decision of opening a third show. At first they started to take possible ticket orders to see if the demand was large enough to justify a Sunday presentation. In just seven days ticket orders went from 20 people, to 113, then shot up to 180 before rocketing into the 300 mark. It seems that a whole new audience of people are jumping at the chance to see the musical. Many have informed the producers that they didn't learn about the event until it was too late or are just finding out about it now. The overwhelming demand that the first two shows had even caught the promoters off-guard. Ticket sells were generated by word of mouth and by internet. While all this was happening, the cast was busy rehearsing at the actual theatre running the show from top to bottom, checking for marks, adjusting entrances and exists and laying down the stage dance floor. The Show currently boasts the performances of 34 dancers from Descarga Latina, Abakua, Mambo Mamas, Santo Rico, Addie-tude & Jai & Candy. These are performances and choreography by some of NY/NJ's favorite mambo instructors/choreographers/directors such as Nelson Flores, Addie Diaz, Thomas Guerrero, Jai Catalano, Candy Mena, Frankie Martinez, Steve Seda, Jesus Nieves. And also there will be a performance by special guest Ray Sepulveda. Ay Carumba! The "Latin Madness" show was great! This first-ever pioneering true mambo theatrical/musica/comedy show was beautifully conceived, produced, staged and danced. Everyone loved it. It was all we were hoping for. Nelson Flores and Carlos Mendoza deserve our great thanks for bringing us such a great production, and all the dancers of Descarga Latina, Abakua Latin Dance Company, Mambo Mamas, Santo Rico, Addie-tude Dancers and Jai & Candy were incredibly professional and skilled. I know that I was like many others in the audience who felt really proud of our NY/NJ dance teams and excited to be a part of this mambo community. No wonder our way of dancing is the envy of the world, and that people come from everywhere to enjoy and learn New York mambo. Just wanted to congratulate you (all) on the SUPER job done with Latin Madness. I went to see the show on Saturday April 28th. I think that this show should be on-going. I hate to see so many people miss the opportunity to see this show. Please talk to your colleagues and see what you can do. Being 52 yrs old, I went through a nostalgic high while watching this show. Boy!, you brought back so many memories. This is what our dance and cultures are all about. Please, please do whatever you can to try and keep this show alive for years to come. I will definitely sell the show by way of big mouth. Madness. Congratulations on an exceptional production.